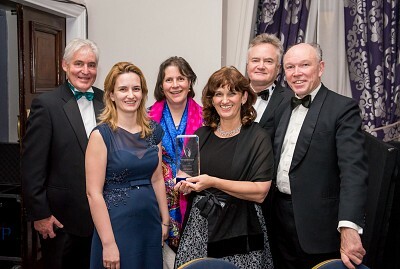 News from Members Simona Baciu, Founder and President of the Transylvania College Foundation receives "BIS Lifetime Award"
Transylvania College is honored to have received extraordinary international recognition at the British International School (BIS) Awards on Monday, January 23rd. A jury of 13 international experts in the field of education awarded the "Lifetime Award" to Mrs Simona Baciu, Transylvania College Founder and President of the Transylvania College Foundation, for her visionary commitment to innovation and excellence in education, as demonstrated over the 23 years of the school's existence. Organised every year in London, the "BIS Awards" Gala is an exclusive event celebrating the accomplishments of the top schools, chosen from over 3000 British International Schools. The award was given in the presence of Mr Colin Bell, Chief Executive Officer of Council of British International Schools (COBIS), representatives from the Department of Education and educational experts from around the globe. The school's excellent reputation has been built throughout the years with a consistent effort from our teachers and our students, together with the trust and long-term commitment received from the families in our community and our strategic partners. The "BIS Lifetime Award" offers us a special occasion to thank, once again, Ms Simona Baciu, for her vision and her dedicated engagement in creating one of the most appreciated education institutions - Transylvania College.